This slow cooker quinoa recipe with chicken is a healthy crockpot recipe your family is sure to love. Bright Mexican flavors blend perfectly together forming a delicious family-friendly casserole. Slow cooker meals make getting a healthy dinner on the table super simple. This delicious chicken recipe needs to be printed and saved for a day when you have 5 minutes to make dinner before heading out the door to work. 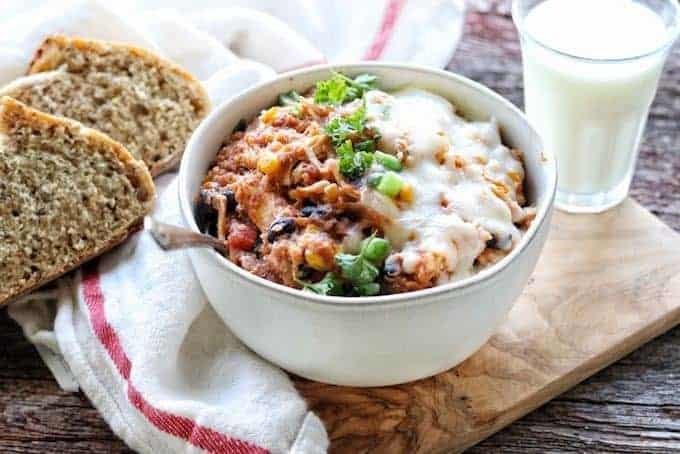 This healthy crockpot recipe can be made in a flash – it utilizes canned foods and only requires you to shred the chicken before serving this quinoa recipe with chicken. If you’re searching for a healthy slow cooker meal that the entire family will love, this is the one for you. Plus, the ingredients of this recipe make for great healthy crockpot meals on a budget as well! Resist the urge to peek—keep the lid on. In meat, keeping the temperature anywhere from 160° to 205° F helps the collagen begin to gelatinize and results in a tender end product. Because the slow cooking process utilizes a little heat and a lot of time, it causes the collagen in the toughest cuts of meat to eventually break down, leaving you with shreds of tender, juicy meat. Make sure leaner cuts of meat stay submerged in the cooking liquid (eg, broth, water, wine). This will ensure they don’t dry out and stay juicy and tender. Cook lean cuts of meat on high so they don’t dry out as quickly; fattier cuts will do better on low. No need to presoak most dry beans and lentils. Slow cooking is one of the best ways to cook pulses perfectly every time. This inexpensive protein source is a great option for the slow and steady heat of the slow cooker. Note: Kidney beans contain a toxin that can cause gastrointestinal distress. You must bring them to a full boil on the stovetop for 10 minutes before adding them to the slow cooker. Layer veggies appropriately to preserve their texture. Place hearty veggies like potatoes, squash, and sweet potatoes on the bottom of the slow cooker (dry pulses go here as well). Veggies that hold up well in the middle portion of the slow cooker include carrots, onions, and peppers. Delicate vegetables such as spinach, broccoli, and fresh herbs do best when added in the last 30 minutes of cooking. Don’t throw out the excess liquid. Simply mix it with a bit of flour, cornstarch, or a cooked roux. The result? Instant gravy. Add all of the ingredients, except the cheese and chicken, into a 4-quart crockpot, stir. Let’s take a closer look step by step so you can easily make this simple and delicious recipe (which happens to be one of the most popular on Create Kids Club!) correctly each and every time. Here are all the ingredients for this slow cooker chicken recipe. Simple ingredients that don’t take a ton of time are key. The great part about this healthy crockpot meal is that it requires very minimal meal prep to prepare. This is just one of those chicken recipes that result in the taste of great Mexican food. Pro Tip: You do not need to precook the quinoa, it cooks in the crockpot. Add all ingredients besides chicken and cheese into your slow cooker. People often tend to want to add more black beans to the recipe, and if you want more protein, do so. All you need to do with this simple crockpot recipe is open the cans and add them to the slow cooker. Dice an onion (skip it if you don’t feel like chopping), add your spices, pour in the quinoa and give it a good stir. Did I mention that this slow cooker recipe is crazy delicious? Stir and add chicken. Cook on high for 4 hours or low for 6-8 hours. On this page http://www.noc2healthcare.com/levitra-generic/ you will learn where to buy generic levitra 10 mg online. Once you have the ingredients blended, nestle the chicken breasts in the liquid and put the cover on to cook. Don’t want to use chicken breasts? You could use boneless chicken thighs, boneless pork chops, or even a beef roast to make a completely different experience. 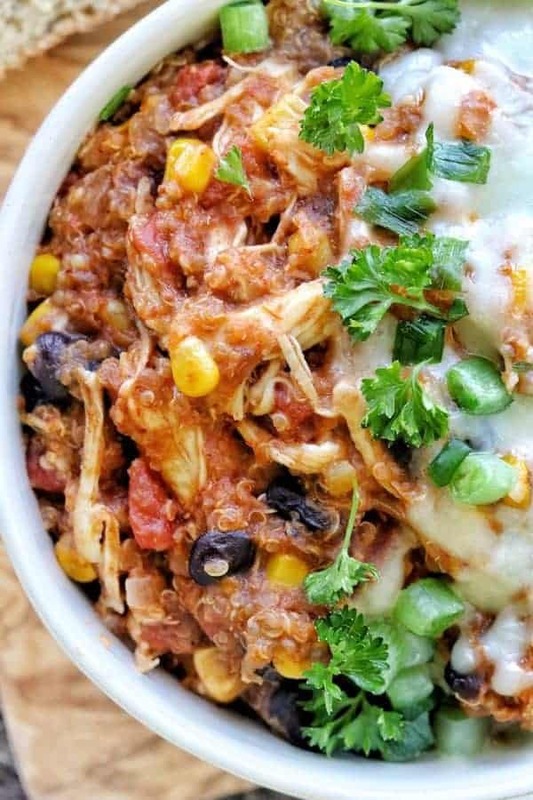 You could cook this healthy crockpot recipe without the chicken and add leftover shredded or rotisserie chicken at the end as well. This is a dump and go recipe that makes plenty for at least 2-3 meals for a family of 4. I have used leftovers on top of a salad, wrapped in a burrito, and have frozen extra portions for later use. If you’d like to try your hand at homemade enchilada sauce, this enchilada sauce recipe takes just 10 minutes and freezes great. Serve with a side of Crock Pot Refried Beans and dinner is ready! Another great idea is that you can give this chicken recipe a kick and add in a little spice with chili powder. However you decide to make this delicious crock pot cooker chicken, know that it is a recipe that everyone in your family will love. Mexican flavors blend perfectly together forming a one-pot meal your whole family will enjoy. Add all ingredients, except cheese, into the crockpot or slow cooker. Once cooked, shred chicken then stir cheese into the casserole. Thanks Jodi, the dish turned out great, I had already decided to use 1 cup of corn. Thanks for sharing the recipe. I took it to a church potluck today and it was wonderful. I am planning to fix it again later this week and think I will try a green chili enchilata sauce this time. I fixed this again using green sauce and liked it even better than with traditional red sauce. One thing I modified was that I doubled the green chilies and didn’t add any water. The consistency was great and I think it would have been a bit runny with the water. That is great, Janita! I actually just remade this recipe myself this week. The consistency was perfect with the water, the quinoa soaked it all up 🙂 I love the extra green chilies, I will have to give that a try. It sounds really good. I’m looking forward to trying it. Even my picky husband loves this recipe. He has no idea he is eating quinoa:) I hope you enjoy! 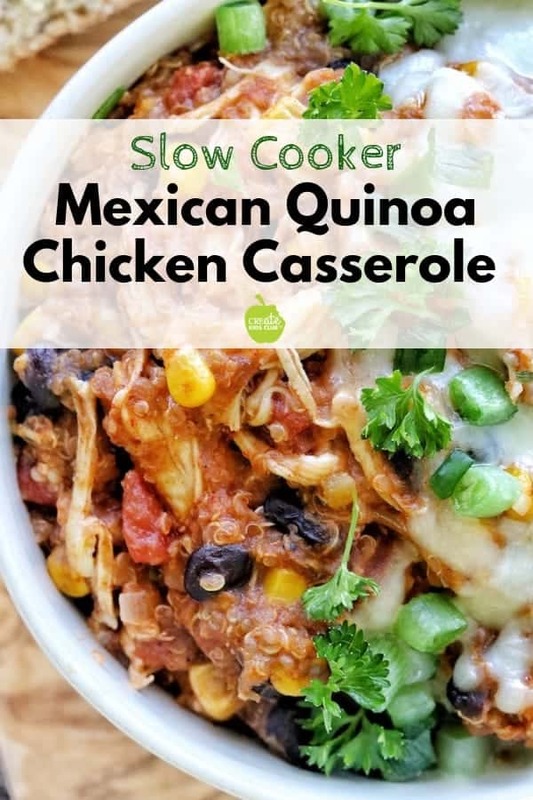 I have a quinoa and black bean recipe which is similar in ingredients without the chicken or diced tomatoes or crock pot for that matter and all of my family members love it. In fact, my son even requests that I make it! It is always nice when you find a healthy recipe that everyone likes! That is for sure, Michelle! It doesn’t happen as often I as I would like here at my house, so those recipes are keepers! I love spicy food and am having fun trying out new quinoa recipes. I made a spinach quinoa salad yesterday that was so fresh. 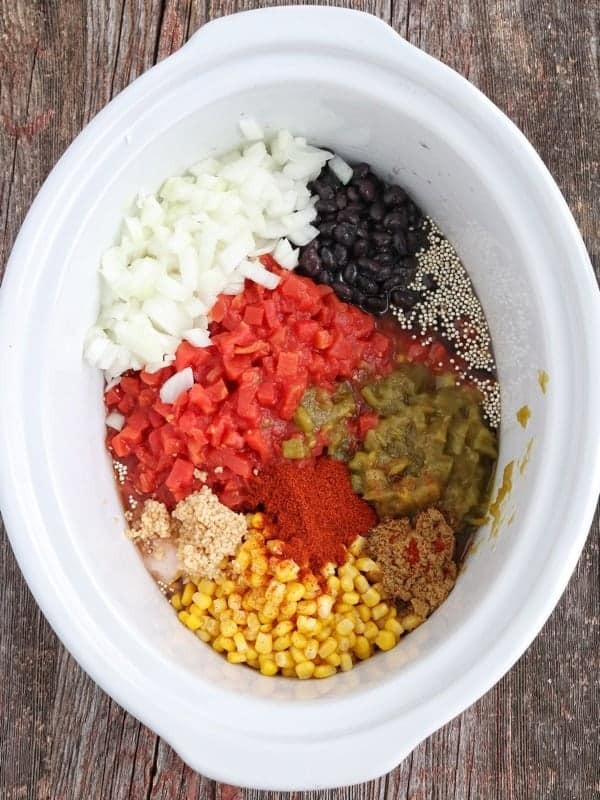 Your slow cooker mexican dish does look delish! I just made this and it is a fantastic recipe! I thought I had green chiles, but I guess I bought jalapeños instead, so I substituted those, and I used chicken stock in place of the water. I also had this lovely tri-colored quinoa I’ve been meaning to use up. Honestly, I already had everything in the pantry except for the chicken and onion, so this was a good pantry clean out recipe as well. I totally agree, Erin! I love using up things that are laying around, and this recipe works so well to add some extras to. I am thrilled you liked it as much as my family did:) Thanks for sharing! These are great ideas Audre! I love your suggestion of using quinoa in a stir fry! Hi, this looks great-going to try it this weekend. Do you put in the chicken breast whole or chop them up? Awesome ! I put them in whole, and shred once they are cooked! Good luck!! ? Yum! I make something very similar to this and we LOVE it. I’m all about crockpot meals this time of year; I love the convenience of it. Me too, Chrissy! There never seems to be time for more than crock pot meals! I love Mexican inspired meals & I love my crockpot! So fast, easy, & delicious! This is such a super tasty looking casserole! I think it’s perfect for family weeknight dinners!! Yum! Pinning! This looks soooo hearty and delicious! I have tried quinoa with my husband and we both love it. I’m totally loving your mexican style feel to it. Thanks Abbey! It was the first time I got both my kids and hubby to actually eat quinoa, Mexican food for the win! I’m addicted to my slow cooker this time of year. There’s nothing better than coming home, smelling that awesome meal and knowing dinner is ready! I love the addition of quinoa instead of rice in this dish. Yum! I have a similar dish, but vegetarian and baked in the oven. I’ll have to try it out in the slow cooker for those busy days. This looks amazing! My husband had a Mexican quinoa casserole at a potluck once and wanted me to get recipe. This would be great – thanks!! This sounds delicious! I’ve been trying to get my SO to get more quinoa in his diet too! This was the recipe that got mine eating quinoa :). No one seemed to notice it was in there :). Good Luck! I love one pot meals – they make getting dinner on the table so easy on busy days! Even better that it uses the crock pot, no cooking! Me too, Melissa! I love that you can toss everything into this recipe and then leave it all day. Not much better than that! I only have ground chicken, I’m worried it will be too dry? Should I pre-cook the meat and add at the end? Hi Bryan – I use 1 cup as a serving size for this casserole. I hope you give it a try 🙂 I’d love to hear how you like it if you do! When do you add the refried beans? On the side or in the crockpot? Hi Samantha! There are no refried beans in the ingredients, but they would make a delicious side dish! I hope you enjoy! The perfect way to try quinoa. 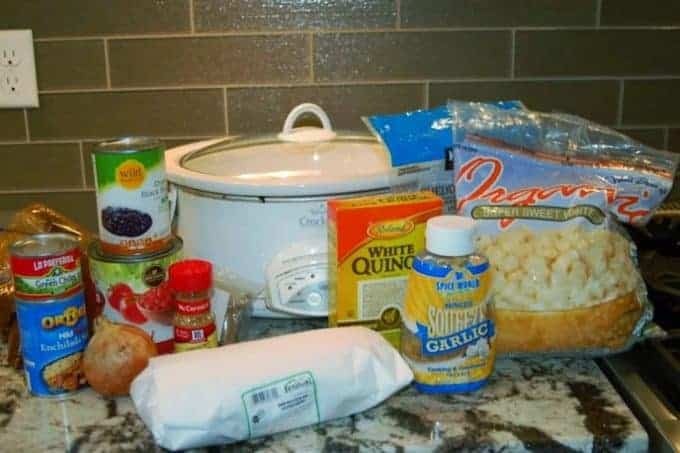 I have made this several times for pot luck and I always go home with a cleaned out crock pot and numerous requests for the recipe! Thank you for a simple healthy fabulous recipe! 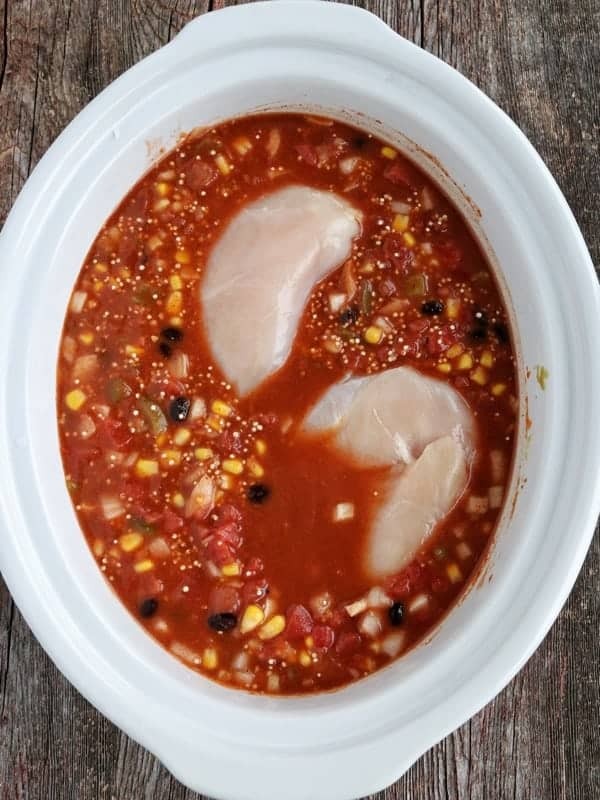 This is definitely one of my fav family crock pot meals to make! It’s so good, and makes great leftovers for lunch at work the next day. We’ve made it plenty of times, and it just gets better! Amazing recipe, thank you. Perfect for a bachelor like myself who doesn’t have the time to cook daily. I was wondering, though, should I add any water? The recipe doesn’t state so, but it is brought up in the comments. Great catch Gabriel!! In the process of transferring recipes to a new layout, I think the water got missed. I updated the recipe to reflect the change – thank you for letting me know! I hope you enjoy the dish! I am thrilled to hear this, Marcy! Picky teens + a 2-year-old?! That’s awesome – Thank you for sharing! My favorite crock pot recipe, ever. Just perfect. I, too, always use green enchilada sauce per one of the comments. I’ve actually never tried it with red because I liked the green version so much. I could literally eat this every day. Thank you for creating it! Sarah – you made my day! Thanks for the kind words, and the encouragement to try the green enchilada sauce myself! I use it in one of my enchilada recipes on the blog and it really is delicious! I was wondering what changes to the cook time there would be if I changed the quinoa out for rice! I’m not much of a quinoa person myself but this recipe sounds delish. If you use regular rice (not the 10-minute rice) I think you could leave it the same. I’d love for you to let me know how it works if you try it!